A glorious morning that promised to get hotter said that it was at last time to break out the silk. Crocs get a little warm in warmer weather, too, so it was also time for the Teva sandals. At last; this is what France should feel like. After sampling the croissants (excellent) from the most local supplier, we set off on our bikes to investigate La Tremblade, a small town, situated in a marshy area with mud flats on the estuary of La Seudre river in the heart of the ostriculteur (oyster farming) business. The oyster fishermen/farmers (whatever they are) make for interesting entertainment. 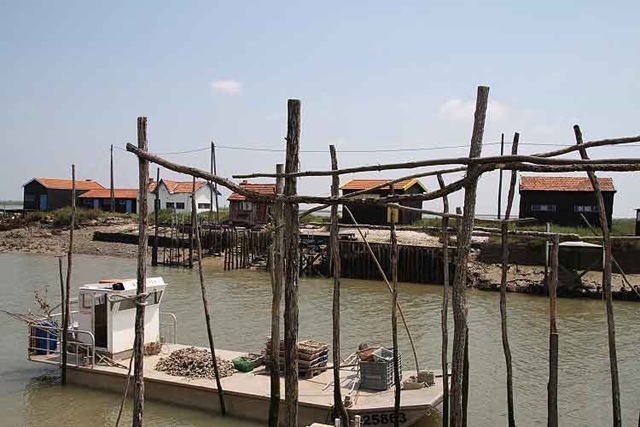 Every day, flotillas of small, unstable-looking flat-bottomed boats go screaming out into the estuary to do whatever they do to their oyster beds. This seems to happen approaching low tide when, I imagine, they can jump off the small, unstable-looking flat-bottomed boats into what remains of the water wearing their waders and do their thing. The flotillas of small, unstable-looking flat-bottomed boats then come screaming back in, some laden with a new crop of oysters. We had visited this area once before, about six years ago, and had enjoyed a magnificent plateau de fruits de mer (seafood platter). 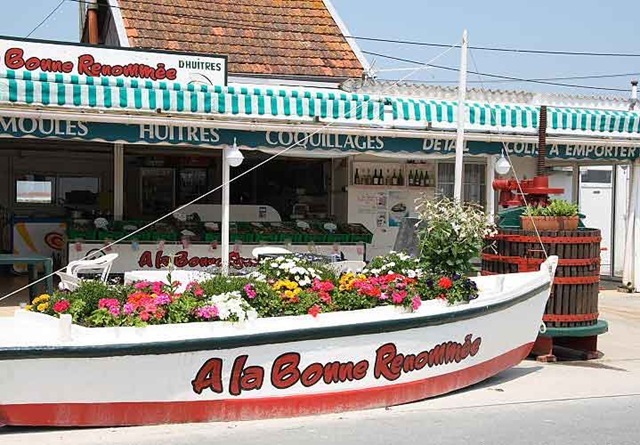 We were in La Tremblade largely to check out the restaurant at which we had eaten this feast. It was still there but shut on a Monday. It was getting into lunch time and I needed little persuasion from Carol to pop into one of the several degustation (tasting) shacks belonging to the oyster producers and sample their wares. Following a cursory investigation we returned to the very first shack we’d considered. Here, they were selling assietes de huit huitres (plates of eight oysters) which could be washed down admirably with a bottle of blanc marines, a dry white wine with a suitable salty tang that complements the oysters very well. There were two choices to be made. The oysters are graded between numbers one to six based on size, one being the largest. Within size, there was also a choice between fine and supérieur. If I understood the French explanation correctly, the latter were "fatter" (how poetic). We chose to sign the death warrant for 16 fines number twos. Being a producer’s shack, the whole experience was utterly unpretentious, quite basic and entirely delightful; sitting in a shaded veranda, sucking down what turned out to be quite simply the best oysters I have ever tasted anywhere, sipping the occasional glass of cool white wine and overlooking a sunny creek. Heaven! Invigorated by our oyster feast, we cycled up to the bridge over La Seudre to watch some of the little oyster boats scream in and out, where we could see the bridge over to the Ile d’Oléron in the middle distance, before returning to camp the long way via a cycle track through the wooded coastal area to La Palmyre. An enjoyable ride of 31 miles in all. That oyster shack apparently does plateau de fruits de mer. Now there’s a thought.